On Krem Television’s Sunday night football report, following the Saturday night game between BDF and Verdes at the Carl Ramos Stadium, Krem’s Mose Hyde asked Tilliman if there was any truth to the rumor that this might be his last season. Tilliman, who played last season with FC Belize but is now with Verdes FC, confirmed; this would be his last semipro football season. From all reports, Norman “Tilliman” Nunez is still in 2013 at the top of his game, minus a little speed and endurance that comes with passing the 40 year threshold. Nevertheless, he remains a major force even at this age, and all indications are that he wants to retire while still counted among the top performers in the sport. Indeed, there are quite a few football fans who hold a seething gripe against former national team coach, American Ian Mork, for not offering Tilliman a spot on the recent Belize Gold Cup team. Belize has produced some great footballers, and Tilliman ranks right up there among the best all-time. In his time, having stepped onto the Belize 1st Division football stage at 16 years of age back around 1988, few would argue that Tilliman was not the best player in his era of Belize football. Whatever his faults, over a 20 plus years career in Belize football, Norman’s record is hard to surpass. His stellar career has sometimes been compared with that of recently retired goalkeeper Charlie Slusher, with whom he shared many championships. Charlie is about six months older, and he just retired at the top of his game last December; but goalkeepers tend to last longer at the top of their profession. After a sterling striking career, and now a midfield “general” still with a goal scoring touch, Tilliman, at 41, is indeed a Belizean football marvel; but “all good things come to an end,” and football fans should not overlook that fact. With the present regular season format, each home stadium is only guaranteed one look at each of their 6 opponents. Except for Verdes FC fans at the Marshalleck Stadium, who will get to see Tilliman perform in 6 regular season home games, the fans at all other stadiums will have one chance only this season to see the legend in action. Unless, of course, you decide to travel, or if Verdes makes the 4-team playoffs. For the skeptics and critics of Tilliman, consider the remarkable feat that he has maintained himself free of alcohol and crack addiction throughout his almost twenty-five years at the top level of Belize football, and has exemplified true professionalism in total dedication to his craft and maintaining his body in the best physical condition. That spells a commitment to excellence, which it would behoove our football heads to consider when his playing days are over and, as he indicated on Saturday night, he embarks on a new career in coaching. 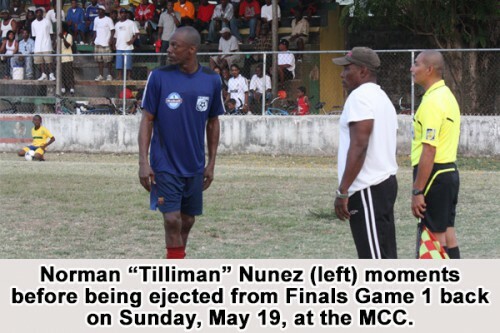 Until then, the FFB, the PLB, and football fans across Belize should relish these last remaining opportunities to see Norman “Tilliman” Nunez in action. Let’s show some love and respect when our own living Belizean football legend visits your “neck of the woods” for the last time this season.